Clara Grant OBE is known as a pioneer of education in the East End of London. 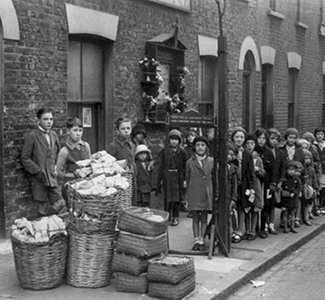 In 1907 the headmistress of Devons Road Primary School in Bow set up the famous Fern Street Settlement to help poor families. She provided a hot breakfast for the children in her care, supplied them with some clothes and shoes and – most famously – created and distributed Farthing Bundles. Intended to provide children with toys to call their own, they were available for a token cost and the proceeds were directed back into the Settlement funds. These packages eventually earned her the affectionate nickname of the Bundle Woman of Bow. Children would come to the settlement barefoot and freezing cold. For the price of a farthing they would receive a surprise bundle of toys and goodies. 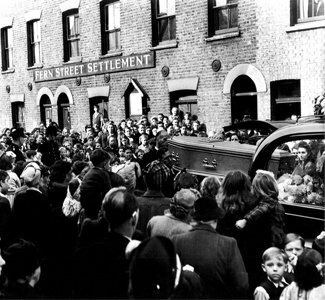 They proved so popular that children were queuing up from quarter to seven in the morning, even though they only went on sale from eight o’clock. They tried various methods of limiting the numbers but they were still selling far more than was practical and in 1913 the famous wooden arch was introduced. Emblazoned with the legend “Enter Now Ye Children Small, None Can Come Who Are Too Tall”, this limited the bundles to the youngest residents. 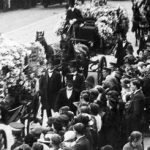 She died in 1949, shortly after receiving an OBE, but Farthing Bundles were sold until 1984, the Devons Road school was renamed the Clara Grant Primary School in 1993 and the Fern Street Settlement continues as a centre for the local communities to this day. A.R. 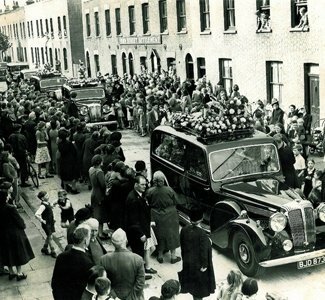 Adams Funeral Directors carried out the funeral service for Clara Grant in 1949. 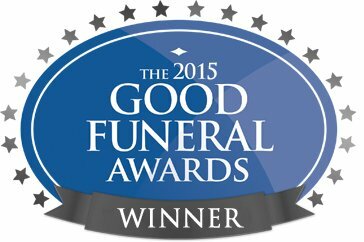 In 2015 we donated our services in cleaning and renovating her headstone which sits within Tower Hamlets Cemetery.